"Since childhood, I have doodled obsessively. When I was a teenager, I started making pots obsessively. In my thirties, it finally occurred to me that I could doodle on my pots. It was an epiphany. Carving on pots was the perfect marriage of my parallel obsessions." 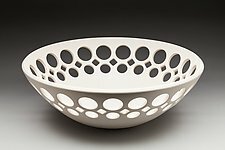 The carved lines of Lynne Meade's pottery embrace the curves and seem to flow over the form, becoming one with it. 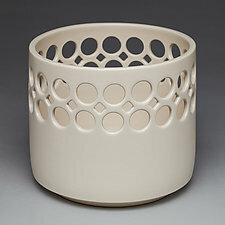 The simplicity of the form and the purity of porcelain offset the complexity of the lines. 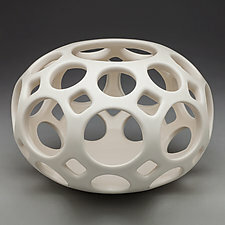 Organic imagery, botanical or sea forms, repeat in ritualistic, soothing patterns. 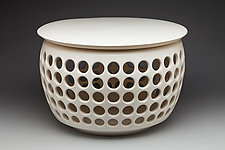 Meade's wheel-thrown and hand-carved pieces are either one of a kind or of a limited series. Using no molds or templates, she carves designs freehand when the clay reaches the bone dry state. 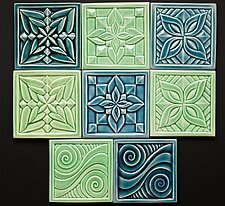 She carves first with ceramic trimming tools, and finishes the fine detail with dental tools before firing each piece with a simple, clear glaze. 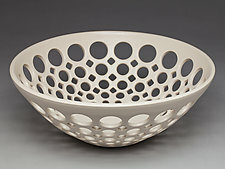 Meade's passion for clay led her to study ceramic design at Wesleyan University in Connecticut. After receiving a degree in art, she served as an apprentice for two well-known artists in Cambridge, Massachusetts. What she learned there allowed her to eventually open her own studio in 1987. Today, she creates her unique pieces in her studio in Oakland, California.